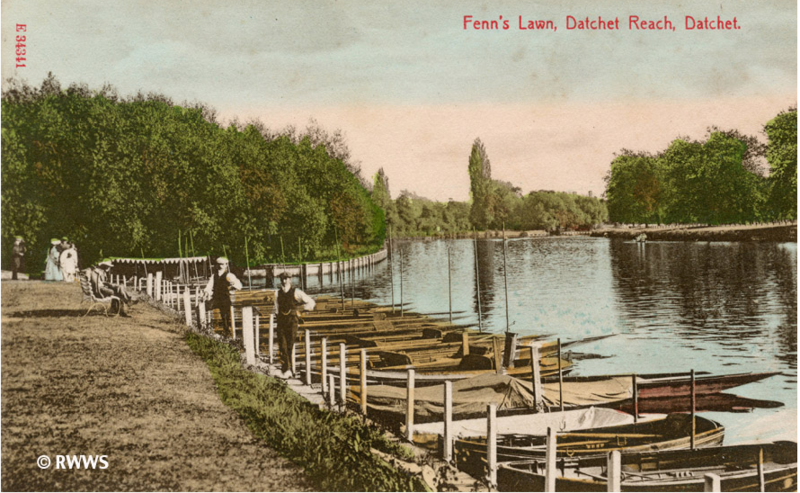 In the 1880s, Sidney’s grandparents, John William Thomas Fenn, a former London chemist, and his wife, Naomi (née Parks), a baker’s daughter, moved from their home near the river in Fulham and started a boat business in Datchet. The village was also going through a period of expansion following the building of the railway in 1850, and development had started along The Avenue, Montagu Road and Buccleuch Road from the 1870s onwards. 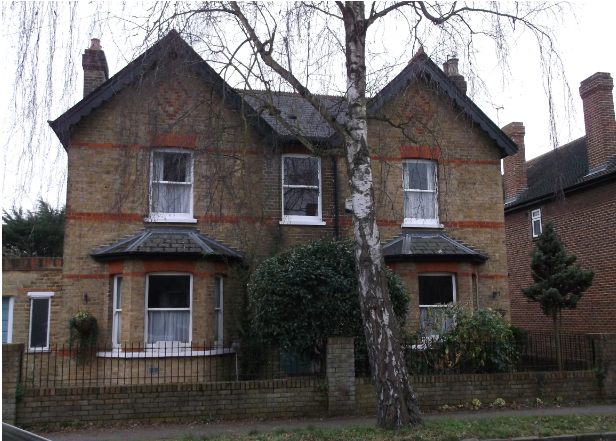 The Fenns moved originally to Dalkeith Villa and then Haslemere in Montagu Road. They used the space behind the house, (currently an automotive engineering workshop), for building and storing boats. An area on the riverfront, now used by Kris Cruisers, became known as Fenn’s Lawn. It was possibly in Datchet that the Fenns’ daughter, Fanny Louise (1869-1956), met Sidney’s father, William George Henry Burfoot (1870-1949). William was born and raised in Windsor, at Victoria Street and later Frances Road. Rather than following in his father’s footsteps and taking up statuary and stonemasonry, William opted for a job in the grocery trade as an assistant. By 1895 he was advertising in Kelly’s Directory as a grocer in Datchet. After Fanny and William married in 1894, they lived with Fanny’s parents at Haslemere in Montagu Road. William left the grocery trade and started work with his father-in-law, taking on the role of manager of the family firm of boat builders and shipwrights, which later became known as Fenn & Burfoot. Their only child, a son, Sidney Walter, was born in 1897. Sidney was close friends with two other boys in the village, Arthur Widcombe, the son of a coal merchant, who also lived in Montagu Road, and James Pearce, the son of an electrician, who lived in Buccleuch Road, not far from the Queen’s Road boathouse. All three signed up. Sidney attested in Slough in November 1915 under the Derby Scheme. (This scheme was intended to discover how many men were eligible to fight and to recruit more men into the Services.) He enlisted in May 1916 but was not old enough to serve abroad until October when he turned 19. In October 1916, he was attached to the Queen’s Own Oxfordshire Hussars (also known as the Oxfordshire Yeomanry) as private 285996. 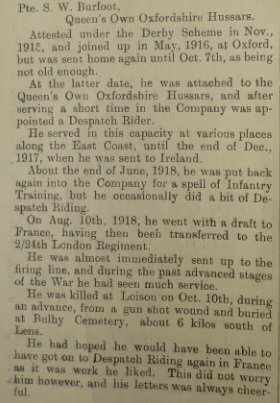 He was on the east coast for a time as a dispatch rider, probably in the 2/1st battalion, which was based near Canterbury until the end of 1917 and moved to Ireland in January 1918. From there he was transferred to the ‘London Regiment’ (Royal West Surrey Regiment) of the Queen’s Royal Surreys, and became Private 74310 in the 2/24th Battalion. On 10 August 1918, Sidney was drafted to France and was almost immediately sent up to the firing line. At that time, the 2/24th London Regiment was part of the 198th Brigade in the 66th (2nd East Lancashire) Division. The 66th had suffered many losses in the first half of 1918 and was undergoing reorganisation. A number of units, including the 2/24th, were attached to the Division between June to September 1918 while it was being reconstituted. Many of these units were disbanded or absorbed into other units as they had suffered heavy losses. Others, including Sidney’s battalion, were eventually transferred to other Divisions. 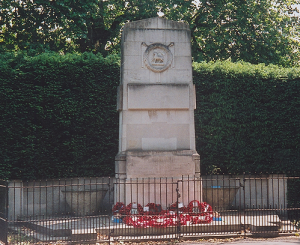 On 11 September, the 2/24th joined the 173rd Brigade in the 58th (2/1st London) Division. They were engaged in The Battle of Epehy (18 September) and the Final Advance in Artois (2 October – 11 November). Two months after arriving in France, aged just 21, Sydney was shot and killed during an advance at Loison on 10 October 1918. The war ended a month later, on 11 November 1918. Sidney was posthumously awarded the British War Medal and Victory Medal. Sidney Walter Burfoot is remembered at Bully-Grenay Communal Cemetery British Extension, Pas de Calais, France, plot VI, row C.13. The epitaph on his headstone, chosen and paid for by his parents, reads: The Only One God Gave Us Played his Part. The Commonwealth War Graves Commission website explains that Bully-Grenay is the name of a railway station on the main Hazebrouck-Arras line, serving the village of Bully and Grenay. The double name was generally applied to the village and the communal cemetery of Bully by the troops. 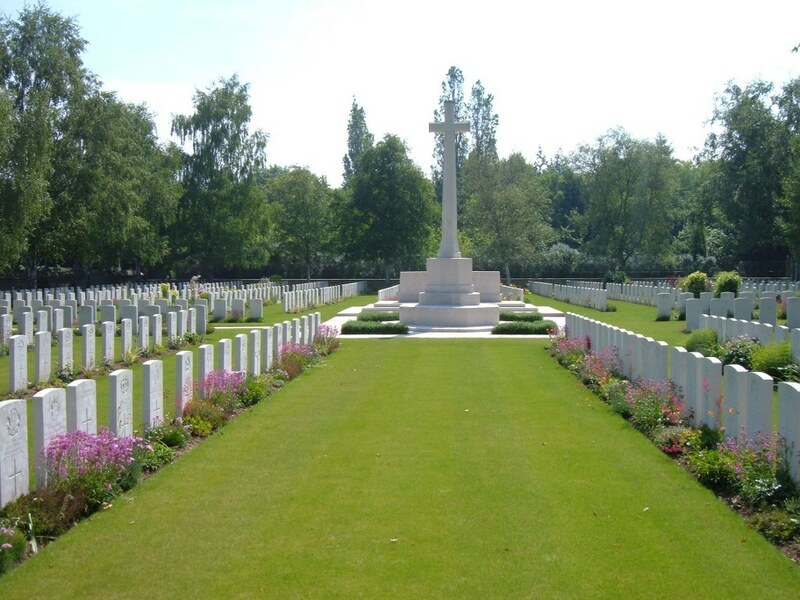 The British Extension, on the south-west side of the communal cemetery, was begun at the end of April 1916. There are now 803 Commonwealth burials and commemorations of the First World War there.